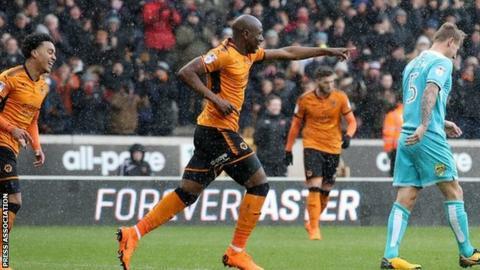 Wolves striker Benik Afobe is revelling at the rediscovery of his goal touch for the Championship leaders after a season spent largely on the bench. The 25-year-old had played one full 90 minutes this season before returning on loan from Bournemouth in January. Afobe was a substitute in his first seven games, but has started Wolves' last two matches, scoring three goals. "The more I've trained with the boys, I've adapted to the way they play and they've adapted to me," he told BBC WM. "I would have liked to have hit the ground running but it's a different team to when I was here before. A lot of different players. But that's four goals for me now. When you get out on the pitch and see the movement and the passes you're given, you can see it work." Having got off the mark with a goal in the 3-0 win at Leeds, Afobe was then given the thankless task three days later of coming on at Villa Park when his team were 3-1 down. The DR Congo striker was then brought in for his first start by Nuno and has since played a major part in Wolves getting their promotion bandwagon back on the road. His strikes have been crucial at a time when Leo Bonatini, the club's top scorer over the first half of the season, has gone 18 games without a goal, while leading marksman Diogo Jota was out injured. But those successive wins over strugglers Reading and Burton have carried the Championship leaders 13 points clear of third-placed Fulham and fourth-placed Aston Villa with eight games left. "As a centre-forward, when you score and your team wins and you're top of the league, you're in dreamland," said Afobe. "It was my first start in three months against Reading last Tuesday night. In fact, I was a bit shocked when my dad told me I'd only played one 90 minutes this season. "It's tough when you're a sub not used every week, coming on for the last five or 10 minutes all season. But the main thing has been to build up my fitness. There's eight games to go. I'll just keep pushing and hope I'm ready when I'm called upon." Benik Afobe was talking to BBC WM's Mike Taylor.